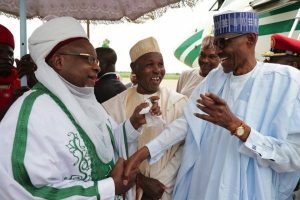 Thousands of residents thronged the Daura airstrip in Katsina State to welcome President Muhammadu Buhari, who arrived his hometown, Daura, for Eid-el-Kabir. The Nigerian Airforce helicopter conveying the president and members of his immediate family landed at the airstrip at 4:45 p.m on Wednesday. The president was received by the Emir of Daura, Alhaji Umar Farouk, politicians and thousands of well wishers. Buhari smiled as he waved to the mammoth crowd. He walked from the airstrip to his residence in the GRA of the town. The President’s arrival excited many residents who prayed for his good health. The Chairman of the Daura Emirate Amalgamation of Political Associations, Alhaji Ali Rabe said that arrangement for a thanksgiving service had been concluded. Rabe said that the event would hold two days after Eid-el- Kabir. Massive security has been mounted in and around the ancient town.